No matter what your skill level, unless you’re a professional tradie, there are some jobs you’re legally not allowed to do. If you wish to install power in your shed, you must have it done by a licensed electrician, and you’re required to use a licensed plumber to connect roof water runoff to storm water drains or install a sink or tap. All plumbing and electrical work must be accompanied by a certificate of compliance. Connecting roof run-off to the storm water drains must be done by a licensed plumber, and installing any electricity must be done by a licensed electrician. You can get around the need for a plumber by managing your water runoff in other council-acceptable ways, which can include water tanks and infiltration trenches. Both of these increase the rainwater available to your garden. Talk with your local council to see what’s acceptable in your area. 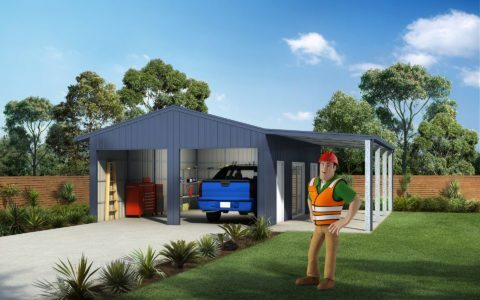 For a larger shed or garage, you’ll want power for at least the roller doors, lights and an external sensor light if you don’t already have one – so you don’t fall over the garden hose on the way into the house. If you plan to use your shed as a workspace, place your power points logically and minimise the need to run cords across the area. If it’s just lights, roller doors and a few domestic power points, you’re looking at a relatively inexpensive job. Give your electrician a full list of what you plan to run in the garage and the current ratings of your major tools. This will help your sparkie determine the best wiring plan for your shed. If you want to run a welder, lathe, compressor or other more industrial-level tools, they can require more complicated wiring and power supply. Be prepared to pay for heavier wiring for 15-amp or 20-amp outlets. If you opt for three-phase power, the cables are expensive, which can add up if your shed is a long way from the existing three-phase termination. If you plan for a telephone line or data cables in the shed, your electrician will need to allow for separate conduits at least 150mm from the power conduits. This will add to the cost, but it’s worth getting it right at the start, which is usually cheaper than trying to fix things later. It’s usually best to wire overhead lights so they are on a separate circuit from the wall outlets. In that way, if a power overload from a tool trips a breaker, the lights will remain on since they are on a separate circuit. Adequate lighting is critical in a workshop setting. Think about your general lighting needs first, then about specialised needs for specific areas. There are a number of lighting options available but LED components these days are best.